S7 Airlines, a member of the oneworld® global aviation alliance®, announces adding the first Airbus A321 airliner to its fleet. S7 Airlines obtained a modern narrowbody Airbus A321 aircraft on lease terms from the lease company ILFC. The liner is designed to carry 219 passengers. Airbus A321 is based at the Moscow Domodedovo Airport and will perform flights to the cities of S7 Airlines route network — Anapa and Khujand — already today. Before the end of the year 2013 there will be four Airbus A321 aircrafts in S7 Airlines fleet. The А320 family aircrafts (A319/320/321 aircrafts) make up the bulk of S7 Airlines fleet. The new Airbus A321 aircraft is the 38th A320 family aircraft in S7 Airlines fleet. A320 family aircrafts have the most spacious and comfortable cabin in their class. The most cutting edge technologies in the areas of aerodynamics, engine building and avionics were used in the development of these aircrafts. S7 Airlines currently operates one of the most modern aircraft fleets on the Russian air transportation market. At the moment S7 Airlines fleet comprises 55 aircrafts: 20 Airbus A319, 17 Airbus A320, one Airbus A321, one Airbus A310, two long haul Boeing 767-300, four Boeing 737-400 and ten Boeing 737-800. S7 Group member airlines (www.s7.ru) — Siberia and Globus, operating under the brand of S7 Airlines, are members of the oneworld® global aviation alliance. S7 Airlines also performs regular flights across Russia, to countries of the Commonwealth of Independent States (CIS), Europe, the Near East, Southeast Asia and countries of the Asia-Pacific region. 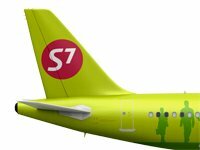 S7 Airlines operates one of the most modern and «young» aircraft fleets on the Russian air transportation market. Siberia has the widest domestic route network, created on the basis of two air transport hubs: in Moscow (Domodedovo) and Novosibirsk (Tolmachevo). The airline company has more than once won the Wings of Russia Award in different categories. The airline company was also the winner of the annual «People's Brand/Brand No. 1 in Russia» Award. Globus Airlines is specialized in regular flights across Russia, as well as regular international flights. The company has been more than once awarded with a Quality Certificate of Moscow Domodedovo Airport for the timely performance of its flights.